With all eyes on Wimbledon 2015, we take a light-hearted look at story and language of tennis. The phrase “Anyone for tennis?” is thought to have been coined by George Bernard Shaw in his 1914 play Misalliance, in which Johnny Tarleton asks “Anybody on for a game of tennis?” This phrase has come to typify a particular genre of drawing room comedy about the leisured upper class. And with its roots in royal circles, it really was a sport for the privileged few. The modern form of tennis emerged in the 19th century, but earlier forms of the game had been played throughout Europe since the 13th century – the most well-known being real tennis (or rather, ‘royal tennis’), popular with European royalty and noblemen. In 1571, the first ‘pro tour’ known as ‘Corporation of Tennis Professionals’ was founded by King Charles IX of France, however its popularity waned during the time of the French Revolution due to its association with royalty and the ‘ruling classes’. Fast forward to 1873, England: Major Walter Clopton Wingfield simplified the rules and designed new tennis courts. And so the popular form of ‘lawn tennis’ was born – now one of the world’s most widely-played sports which was originally played on grass. 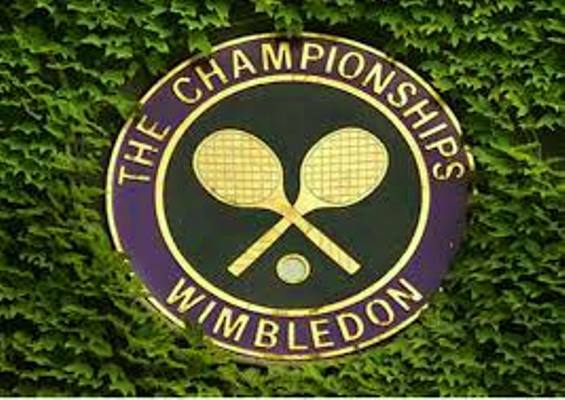 Major Wingfield was careful to preserve the game’s old scoring system of the clock face – 15, 30, 45 (the 5 being dropped to 40), as well as the following original French terms used when ‘real tennis’ began. Alley Late Middle English from Old French ‘alee’ meaning ‘passage’. This is the area of the court between the singles and the doubles tramlines. Deuce From 15th century French word ‘deus’ meaning ‘two’. A player must win two consecutive points to win the game; two players have equal points. Love From French ‘l’oeuf’, meaning ‘egg’. Zero points – an egg being a similar shape to a zero. … Have you ever wondered where the term “goose egg” (used to denote a zero score) comes from? Racquet / racket From 16th century French ‘raquette’. The racket! Rally Used since 17th century, from French verb ‘rallier’, meaning ‘to bring back together again’. A series of return hits of the ball that ends when one player fails to return the ball within the play area and the opponent scores a point. Tennis From Old French ‘tenez’, meaning ‘take heed’ or ‘get ready to receive’ (called by the server to the opponent), and is still today the imperative of the verb ‘tenir’, meaning ‘to hold’. The name of the game! Volley From late 16th century French ‘volée’, derived from Latin ‘volare’, ‘to fly’. A shot taken close to the net before the ball bounces on the ground. Etymax is a leading London-based translation company and specialised language service provider to the global sport, leisure and tourism sector. For expert, professional translation of your global media, contact us.